October is International School Library Month, and Monday, October 22nd is International School Library Day. The theme this year is: School Libraries: A Key to the Past, Present & Future. 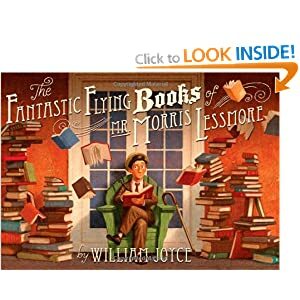 To celebrate, this week, Ms. Lehnert will be showing students in grades 2 – 7 the Academy Award winning animated short film The Fantastic Flying Books of Mr. Morris Lessmore. Ms. Lehnert will show the story through the interactive iPad app. There will be 2 lunchtime screenings; grades 4-5 students on Tuesday, and grades 6-7 students on Thursday. Grades 2-3 students will be viewing the story during their regular library visit this week. “Inspired in equal measures, by Hurricane Katrina, Buster Keaton, The Wizard of Oz, and a love for books, “Morris Lessmore” is a story of people who devote their lives to books and books who return the favor.” This is a rich and heart-warming story that will delight all students. Please note: this story is suitable for grades 2 and up. 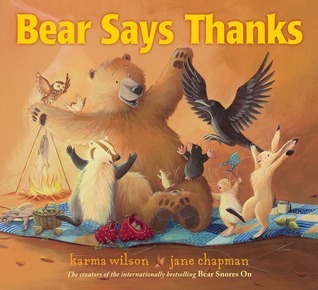 The Kindergarteners and grade 1’s this week will be reading the new Bear story from author Karma Wilson, Bear Says Thanks. Bear’s friends come over with tasty treats to eat, but Bear’s cupboard is bare. What can Bear offer to his friends? This entry was posted in Weekly Read-a-Louds and tagged animated short film, friendship, International School Library Month, iPad app, Weekly Storytime. Bookmark the permalink.